Ready for an empowering opportunity to use entrepreneurship to change society? Looking to feel proud to contribute to an impact-driven startup? Want to be supported in an empathetic work environment? Great - Come work at Proof! We're a startup transforming governments using technology to enable data-driven decision making. Are you a specialist in a role you know we need, but don’t have posted? Let us know! In the meantime, we will post our current opportunities below. Working with the Chief Governance Officer, you’ll learn a unique blend of entrepreneurship and government change at a "drink from a firehose" pace. 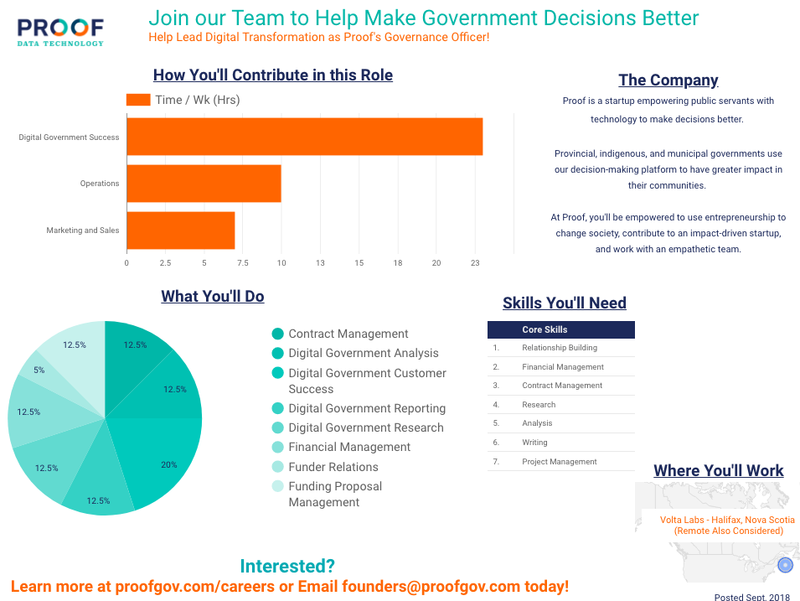 For someone passionate about government, and wanting to work at a more agile speed, this will be a supercharged policy environment where you’re navigating government decision making on innovation, funding, procurement, privacy, and technology. You’ll be leading research and analysis, engaging with the public sector, and writing reports. As an entrepreneur, we need someone ready to help run startup operations. You’ll be involved in financial management, cash-flow planning, bookkeeping, funding proposals, project management and intellectual property protection. - Business, entrepreneurship, and change-making, e.g. starting orgs or initiatives. - Incredible learning in an empowering, impact-driven startup with an empathetic team. - A salary that supports you while you earn equity in a growing startup. Proof is striving to support diversity and equal opportunity by building a team that represents a variety of backgrounds, perspectives, and skills. The more inclusive we are, the better we will be. Think you're the right fit? Connect on LinkedIn or send an email today! © Copyright 2019 Proof Data Technology, Inc. All rights reserved.